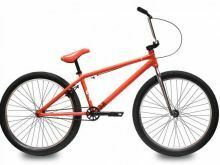 2015 Cult x Simpsons x Duff 24"
2015 Flybikes Proton BMX bike The bike for the all around rider, trails rider, taller riders or simply riders that like bigger and more stable bikes. With a 21” tt, medium 13.6” rear end, big 8.75“ bars and regular 32mm. offset forks. 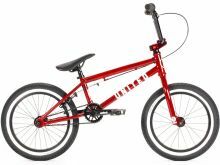 The bike for the all around rider, trails rider, taller riders or simply riders that like bigger and more stable bikes. Specificaties: *Frame: 100% 4130 CrMo 21” Top tube 13.6” Rear end 8.5” Standover *Bar: 100% 4130 CrMo 8.75 x 29” *Fork: 100% 4130 CrMo 32mm. offset *Trebol rims *Trebol sealed rear hub *Trebol sealed front hub *Flybikes Medio seat *Trebol Tripod post 6061-T6 Aluminum *Trebol top load stem *Trebol ICS 4130 CrMo cranks with sealed Spanish BB *Trebol 25t 4130 CrMo sprocket *Removable brake mounts *Manual Springhanger brake *Manual lever *Flybikes Ruben 2.35 tires *Devon grips *Ruben graphite pedals *Weight: 10.800 grs. / 23.8 lb.